On Sunday, March 5, 2017, Archpriest Chad Hatfield, president of St. Vladimir’s Seminary, was guest homilist during the Great Vespers service celebrating the Sunday of Orthodoxy, at Holy Ghost Russian Orthodox Church, Bridgeport, Connecticut—whose rector is Archpriest Steven J. Belonick, seminary alumnus (M.Div. ’77). The parish hosted the event, which was sponsored by the New England Clergy Association. Metropolitan Jonah presided over the 2012 Sunday of Orthodoxy Vespers held at Holy Cross Antiochian Orthodox Church in Linthicum, MD, and spoke on Orthodox unity in America. Archpriest Michael Oleksa speaks on Orthodox cultures at Orthodox Education Day at St. Vladimir’s Orthodox Theological Seminary. V. Rev. Fr. Steven J. Belonick: It is our distinct pleasure—it is my distinct pleasure, my honor—to introduce our homilist this evening: Fr. 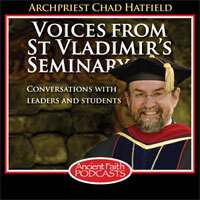 Chad Hatfield from St. Vladimir’s Orthodox Theological Seminary. Fr. Chad is always fond of saying that he is from Kansas—and he is from Kansas. I was once in Kansas, many, many years ago, in Topeka, actually, and I drove from the airport into Kansas. And I’m not sure where I landed, but I thought to myself, “This is very much like Connecticut. It’s not like the Kansas that I imagined.” But I assumed that as you go more west, you get into the fields, the plains, and all that’s there. From Kansas, Fr. Chad was received into the Orthodox Church, and from there he went to be the dean of St. Herman’s Theological School in Alaska, in Kodiak; he spent a number of years there. Fr. Patrick studied with Fr. Chad there in Kodiak. After a number of years there, God opened up a door to him to come to St. Vladimir’s Seminary, which is right down the road here on I-95. He’s been there since probably—what year, Fr. Chad? V. Rev. Fr. Chad Hatfield: 2007. Fr. Steven: 2007. He recently was named the president of St. Vladimir’s Theological Seminary, which is a very high honor. Fr. Chad is a well-known speaker throughout not only the United States, a retreat master, but also a spokesman for the seminary throughout the entire world for that matter. So we are very privileged to have him come to Bridgeport—all the way from Kansas. And we’re delighted, Fr. Chad, to have you. God bless you. Welcome to Holy Ghost Church in Bridgeport. Fr. Chad: In the name of the Father and of the Son and of the Holy Spirit. [Amen.] Fathers, brothers and sisters in Christ, I want to thank my brother, Archpriest Steven Belonick, for that kind introduction. Believe it or not, in one of my two Kansas parishes, I had a parishioner who grew up here at Holy Ghost Church, Helen Russell, so you may remember her, God rest her soul. She’s actually buried in Salina, Kansas. She also had quite a jump from Connecticut to Kansas; that was where she chose to be buried. I also want to thank my brother clergy from the Bridgeport Clergy Association for giving this kind invitation to be among you. This parish is hosting tonight inter-Orthodox vespers, as we call the first Sunday in Great Lent with a particular name. We like to call this the Sunday of the Triumph of Holy Orthodoxy. We’ve been keeping this feast and this particular practice of the procession as we have just completed with our icons and crosses since the Empress Theodora ordered Patriarch Methodius, who by all accounts was a pious and godly patriarch of Constantinople, in 843 on the first Sunday of Great Lent to assemble the faithful for a procession with the icons and crosses and candles so that the holy images might be restored to the Church for veneration, remembering that we worship the Creator, not that which has been created. All of that was settled by council. We know the role of the Empress Irene, but like so many things in holy Orthodoxy, it took us a while before we could get everything settled and in order. The Empress Theodora did not have the support of her late husband, the Emperor Theophilus. In a dream, she saw a vision of her husband being tortured for his heterodoxy as an iconoclast, one who was a destroyer of the images. In the dream, she saw herself pleading for her husband, and the voice of an angel spoke to her, saying, “Great is your faith, O woman.” She was told that by her prayers and tears forgiveness had been granted to Theophilus. The intercessions of the priests and of the faithful had been heard, so she was assured. Patriarch Methodius had previously written the names of all of the heretical emperors, including Theophilus, on a plain piece of paper, and he had placed it under the holy table. After his own encounter with an angel, who told him that his intercessions had been heard and Theophilus had been forgiven, he tested his vision by going to retrieve the paper and finding not a single name left on it. This good news was shared with the empress and her son Michael, and thus we have the beginning of this festival day which we have observed with all great solemnity in our own procession this night. So we now have our history. History, of course, is very important to Orthodox Christians. We like to look back. One bit of history that I do want to share tonight, however, is closer to our own day and time. That is the question of: When exactly did we start gathering on the evening of Orthodoxy Sunday in America with a focus on Orthodox unity? I’m not sure that I have an exact answer. I don’t have an exact date and time, despite searching fervently for it and getting an awful lot of opinions about it, which, again, is so classically Orthodox. What I do have, of course, is some more history. We know that after the Bolshevik Revolution (1917-1918), the Orthodox Church in North America was unable to maintain the canonical unity that had, well, more or less, prevailed since the arrival of those first missionaries on Kodiak Island in Alaska in 1794. Their missionary efforts are indeed the foundation for Orthodoxy in the New World. The Church is founded, we are told and we proclaim, on the blood of martyrs, and we have that blood in the martyrs of Juvenaly and his companion. When you commemorate him, by the way, Fathers, remember the companion. He always gets left out, but he was a faithful reader accompanying him. We don’t know his name. Of course, there is also St. Peter the Aleut, the young boy. This is all part of our own local Orthodox Christian history. It’s part of the history of our Church in this land, and it is foundational for American Orthodoxy. Holding to the Orthodox faith as to something holy, living it with all their hearts, and prizing it above all, Orthodox people ought moreover to endeavor to spread it among people of other creeds. Christ the Savior has said that neither do men light a candle and put it under a bushel but on a candle-stand, and it gives light to all that are in the house. The light of Orthodoxy was not lit to shine only on a small number of people. The Orthodox Church is universal. It remembers the words of its Founder: “Go ye into the world and preach the Gospel to every creature” (Luke 16:14). “Go ye therefore and teach all nations” (Matthew 28:19). We ought to share our spiritual wealth, our truth, light, and joy with others who are deprived of these blessings, but often are seeking them and thirsting for them and not finding them. In his farewell sermon, also preached on Orthodoxy Sunday in his San Francisco cathedral in 1907, he sounded a similar note which again is worth hearing one more time. This is what he said. It is not enough, brethren, to celebrate the Triumph of Orthodoxy. It is necessary for us personally to promote and to contribute to this Triumph, and for this we must reverently preserve the Orthodox faith, standing firm in it in spite of the fact that we live in a non-Orthodox country and not needing as an excuse for our apostasy that it is not the old land here, but America, a free country, and therefore it is impossible to follow everything that the Church requires, as if the word of Christ is only suitable for the old land and not for the entire world, as if the Church of Christ is not catholic, as if the Orthodox faith did not establish the universe. St. Tikhon had a vision of an ethnically diverse, yet united Orthodox Church, and evangelical witness to and in America. It was set in motion with the consecration of St. Raphael of Brooklyn as an auxiliary bishop, but sadly it never fully reached maturity. The goal, the vision, was never achieved. Church politics, ethnic divisions, and xenophobic fears, and finally the Bolshevik Revolution would shatter Orthodoxy in America into camps and a divided house that we now find ourselves living in today. Russian Americans became at least two groups, maybe three. Serbs had become two, three, and otherwise. Antiochians would divide between New York and Toledo. Albanians, Bulgarians, Romanians would divide, and property lawsuits took a toll, with Greeks, Russians, Arabs, everybody. So much for making an evangelical witness and preaching Christ in the New World. I’m not this evening going to give you the whole history of FOGCPJA, but if you are interested—and I can tell that some of you already are; I’ve piqued your curiosity—you can check it out on Ancient Faith Radio, or you can go to OrthodoxHistory.org. It is fascinating. I spent a great deal of time reading about it in preparation for this evening. But in short—now, pay attention—an Orthodox priest, Fr. John Gelsinger, was drafted, his father contacted a certain George E. Phillies, an attorney in Buffalo, New York, who happened to be both Orthodox and Episcopalian and a Free Mason. Our history is fascinating with the most interesting characters! I believe you all have to agree. Well, with his great legal skills, he was able to bring together what was called the Big Four hierarchs of the time, representing Antiochians, Greeks, Serbs, and Russians. This was an important foundation for what we do here tonight, for that was one place where I could figure in our history where we actually came together to make this common witness, post-Bolshevik Revolution. It was an attempt at Orthodox unity that did bring about E.O. dog tags for our Orthodox military veterans. It brought about clarification of identity as a legal Christian Church by the government. In fact, I saw what is now called a famous photo of these four bishops with Governor Thomas Dewey of New York, signing us into legality. But our unity effort lasted only until November 1944, when the Russians pulled out. Metropolitan Antony Bashir did his best to keep it going, at least on paper, but in the end this effort at Orthodox unity failed. SCOBA, or the Standing Conference of Orthodox Bishops in America, would eventually be created in yet one more attempt to create the pan-Orthodox witness and unity of America. It never became a true, functioning local synod as some thought that it would or maybe should, but agencies such as the Orthodox Christian Mission Center, International Orthodox Christian Charities, Orthodox Scouting, and other educational entities, could in fact find an umbrella through SCOBA. And this is all a good thing, and we can all thank God for that part of our history and how it impacts us today. The bold gathering in Ligonier, Pennsylvania, in 1994 was both an historical moment, full of great hope, but also a marker in our history where the vision of what could be was lit like a candle for all to see. As the candle was extinguished, for whatever reasons, so was much of the energy that had been behind the effort to once again unite Orthodoxy in this land, the energy to push for the Orthodox administrative unity in America dissipated quickly. So we have gathered here tonight, as Orthodox Christians have been gathering once a year on the Sunday of Orthodoxy for vespers to pray for Orthodox unity. How many sermons have been preached over these last several decades on that particular topic at this particular event as we have processed with icons and at least in America we focus on the necessity of bringing Orthodox together so that we may truly witness Christ to this ever-darkening world? Who knows. And that’s all well and good in what we do. We gather together as we’ve done tonight, and we’ve moved on in procession. And I would say tonight that despite the creation of the Assembly of Canonical Orthodox Bishops in America as a replacement for SCOBA, we seem as Balkanized as ever—no progress. What is now commonly called the Council of Crete, convened this past summer, has not in truth energized us to move forward and to finally fulfill the vision of St. Tikhon’s American Orthodoxy, where we can successfully make a united Orthodox witness in a culture that is seeking the treasures that we possess, as we were reminded by St. Tikhon. We in fact seem pathetic for the most part when it comes to sharing what we call the Triumph of Orthodoxy with others. People still look into our tent, looking for the Church of Christ, and finding a camp of tribes. What they see is hardly a picture of a one, holy, catholic, and apostolic Church. St. Tikhon did not see himself only as the Archbishop of the Orthodox in America; he saw himself as the Archbishop of America, and all of the sheep were counted by him as members of his flock. He did not distinguish between Orthodox and non-Orthodox who were his spiritual children. As we mark the 100th anniversary of his election as Patriarch of Moscow and we remember his contribution to the life of the Church in North America, I ask tonight: Can we not recommit ourselves to bringing Orthodoxy to America and America to Orthodoxy? In this spiritual time of the year, when we seek true repentance and amendment of life as true disciples of the living Lord, can we not also call the Church in our land to a corporate repentance, and a re-commitment to becoming Orthodox Christian Church in America, one house, one shared faith, and one common witness? We can’t afford to make peace with our unhappy division. We need to repent of whatever stumbling blocks keep us from being united in Christ in all things. We have a most powerful intercessor in this cause in the person of St. Tikhon. We have heard his words this night and hopefully have caught once again a glimpse of his vision for what can and should be Orthodoxy in America today. Ask yourself, as I asked myself: What do we need to do to set in motion the action steps needed to complete the vision for a faithful witness given by a saint who loved America and served America in the name of his Lord?—and who calls us to unity in Christ this very night. Ask if your prayers this Great Lent can be focused on what needs to be done by you and what we can do corporately in our various churches, dioceses, archdioceses, metropolises, to achieve an end to the division and brokenness that events of history have created and now we live with. If nothing else, at least all of us can utter the words tonight: Holy Tikhon, pray to God for us.